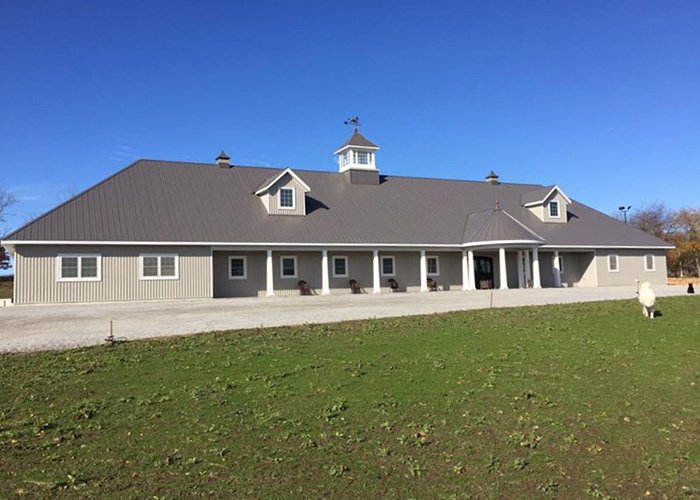 The builders of four spectacular equestrian facilities were recognized for their innovative and enviable designs at the Canadian Farm Builders Association Annual Conference in Stratford, Ontario on January 26, 2018. 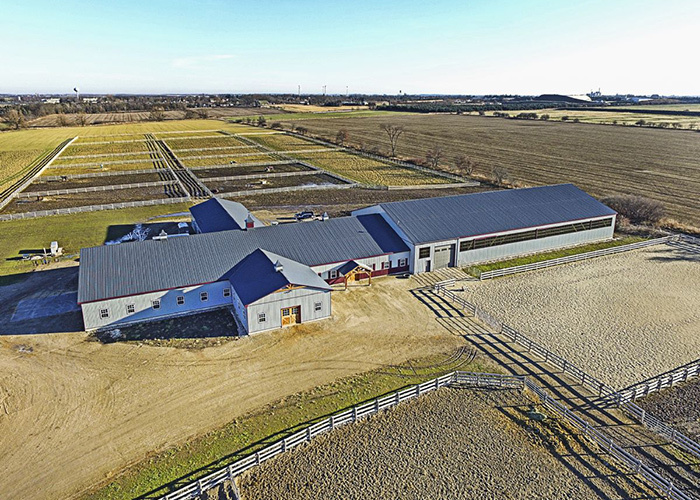 The CFBA’s annual awards program honours leaders in the farm building sector in nine categories, including two which recognize equestrian facilities. To be eligible for this year’s awards, applicants must have completed their project by October 2015 or later. Winners were determined in a “People’s Choice” voting format by conference attendees. The Horse I and Horse II categories welcomed submissions of on-farm facilities for the accommodation of horses including stables, training arenas and tack rooms, etc. The category division is based on the building cost for the completed project. Horse I is for projects up to $750,000, while Horse II is for projects with a value over $750,000. This year’s Horse I winner is Post Farm Structures of Alma, Ontario. The barn and covered turnout they designed features a heavy timber structure, radiant floor heating to alleys and rooms, eight 12’x12’ custom Tuscany horse stalls with swinging doors, a 16’x18’ tack and feed room, custom solid pine double Dutch doors, frost-free hydrants and Ritchie waterers to covered turnout and riding arena, plus large tinted light panels to the arena for natural light. In the Horse II category, there was a three-way tie between HFH Inc., Dutch Masters and Gara Farm Buildings. HFH Inc., who also claimed the 2017 Project of the Year for a robotic dairy barn they designed, is based in Guelph, Ontario. They designed one of the winning Horse II barns in collaboration with their client. 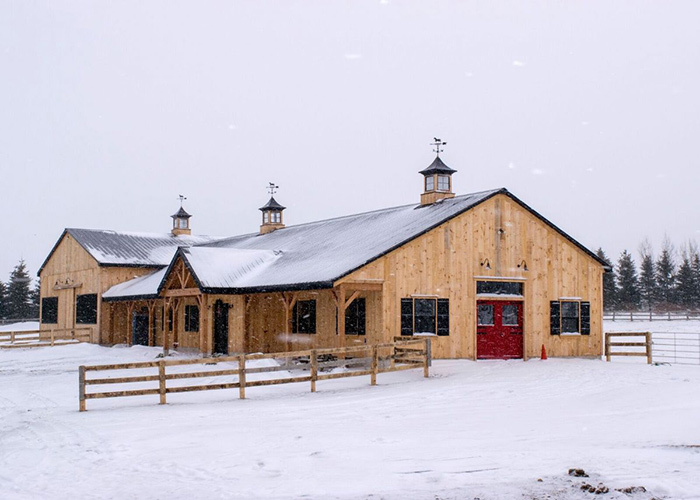 The 35-stall barn is fully lined and insulated, with natural ventilation provided by ceiling fans and large windows. It includes a bathroom, laundry room, viewing room and lounge with a kitchenette, a large office, two tack rooms and feed rooms, plus three wash stalls and ample storage space for equipment. Dutch Masters Design & Construction Services of Springwater, Ontario, was also recognized in the Horse II category. 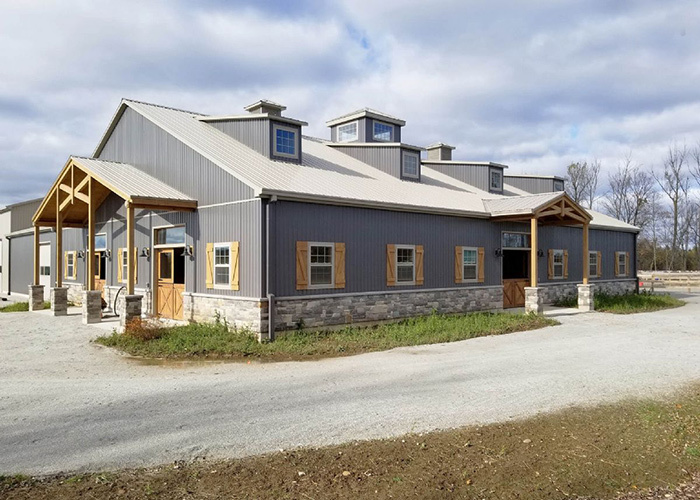 The 10-stall private barn features architectural columns and cupola details to compliment the century farmhouse, as well as a high, vaulted ceiling, large windows and openings for natural ventilation. It has geothermal heating and cooling and LED lighting in arena and stable. It includes a viewing lounge with a fieldstone fireplace and beverage station, plus fully integrated smart home technology to control lights, temperature, arena windows, audio and security system. The third winning project was designed by Gara Farm Buildings Inc. of Belwood, Ontario. The 84’x60’ stable features a ventilation system, in floor heating, soft stalls, an office, bathroom and laundry facilities, tack lockers, 2 grooming stalls, a wash stall and hay storage, as well as a second floor viewing room with a full kitchen and propane fireplace, overlooking the 84’x200’ arena with a sprinkler system for dust control. There is also covered manure storage with an aerator for composting. Visit cfba.ca for more information about the Canadian Farm Builders Association, whose objectives include promoting and advancing the construction of structurally sufficient, environmentally sound, efficient farm buildings in Canada and encouraging high quality work and fair dealings by association members toward farmers and the general public.